Exchange 2010 and 2013 have an option called “Retention Policies”. I’ll base the below on what I see for Exchange 2010, but most of not all should apply to 2013 also. Retention Policies are useful if you need to keep your user’s mailboxes clean, as well as trying to avoid a Deleted Items folder with every single email the employee has received in their time with the company. You can work out what the company agrees with for what can and can’t be auto deleted, and save a lot of money on space for both live information and backups. 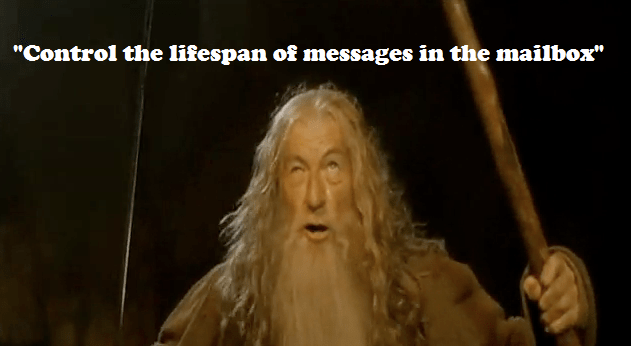 The Retention Policies are made up of “Retention Policy Tags” and these tags “control the lifespan of messages in the mailbox” as quoted by one of the wizards that you configure this in mailbox. The Retention Policy is then targeted at the mailboxes you want to apply these settings to. It’s worth noting that a mailbox can only have one Retention Policy linked to it, so you need to plan overlapping settings accordingly. 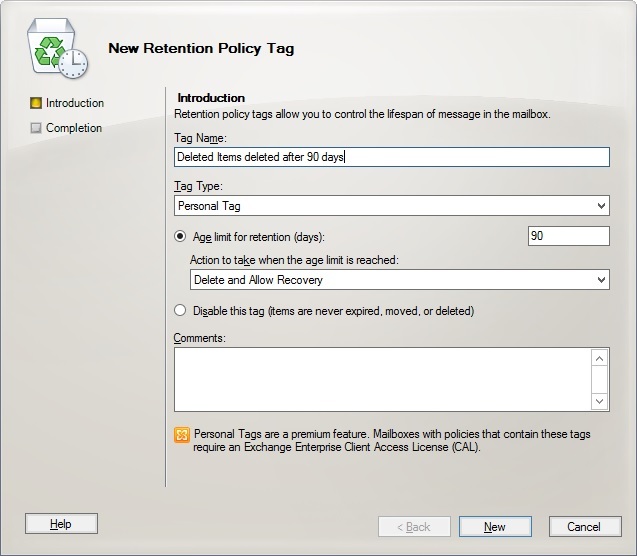 So, what can a Retention Policy Tag do? You give it a ‘Tag Type’ which is either a folder in someone’s mailbox (e.g. Deleted Items) or every other folder that isn’t an inbuilt folder. From that definition of what folder the tag is on, you can either set an age limit for all items in that folder, or set the items to never age. The Age limit is a number in days. This number actually means something different depending what Tag Type was targeted. For an email in the Deleted Items folder, it’s based on the date the item was deleted by stamping it at the time of deletion. There’s some caveats around that, so refer to this chart on TechNet which lays out how the Retention Age is calculated. There’s also a Default Archive and Retention Policy (called MRM Policy in Exchange 2013) that is applied to all mailboxes that have no other policy applied, if archiving is enabled (remember that can only be one). So if you have simple requirements, use this policy. For more complex requirements, you’ll need multiple policies and either manual management of mailboxes to apply the right policy, or use a script that’s run at regular intervals. Once you’re set up, the policies are enforced by the Managed Folder Assistant. This runs on an Exchange server, which is controlled from the service Microsoft Exchange Mailbox Assistants. This used to be schedule based (Exchange 2010 pre-SP1) but SP1 onward and Exchange 2013, this is an always running throttled process. It’ll do it when it’s the ‘right time’ based on several criteria and checks. If you want to know the specifics, read this from TechNet. If you want to do more than a single mailbox, you’ll need to pipe it. Again, more details here on TechNet. The Event Viewer on your Exchange server should tell you how it went, but from some of the information I’ve read, a Retention Policy that’s only just been targeted to a mailbox can take up to 48 hours to actually recognise and start processing. For me it took more than a few hours before I could see the policies on my emails. One last point, when you first create and apply a policy is when Exchange will start tagging emails. For my example, I set it to 60 days Delete and Allow Recovery, on the Deleted Items. This caused all exisiting deleted items that went back a few years to get marked for deletion 60 days from when I applied the policy. It won’t go back and instantly delete your older items. So, for my scenario I wanted to remove most of these options, as we wanted the people with full access to the calendar to be able to see these things. I can understand having this disabled by default, as it’s really a business decision to make on who should see what. For me, I wanted to have the appointment unaltered which means removing “Delete attachments”, “Delete comments”, “Delete subject”, “Delete non-calendar items” and “Add the organizer’s name to the subject” (this one is just for less confusion, and you can still see the organiser from the attendees on the appointment itself). “Remove the private flag on an accepted meeting” I’d rather keep, if someone’s actually marking the meeting as private there’s hopefully a good reason. Anyway, changing these options works perfectly, but doing it on a mass scale isn’t fun via the GUI. Powershell time! That’s it. All your rooms will now have the options you want. 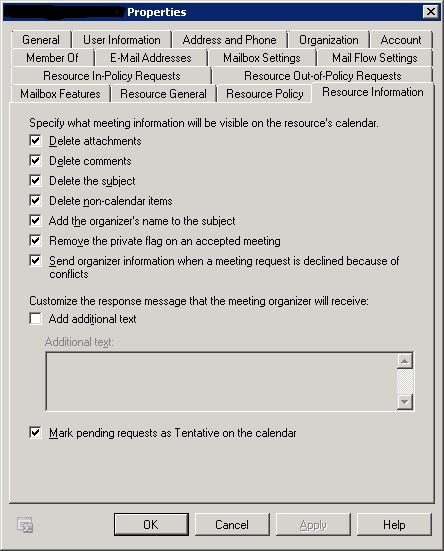 There’s a great article on MSExchange that covers this and a lot more: http://www.msexchange.org/articles-tutorials/exchange-server-2010/management-administration/resource-mailboxes-exchange-2010-part4.html and also has a table of the options on this screen and the relevant powershell parameter.